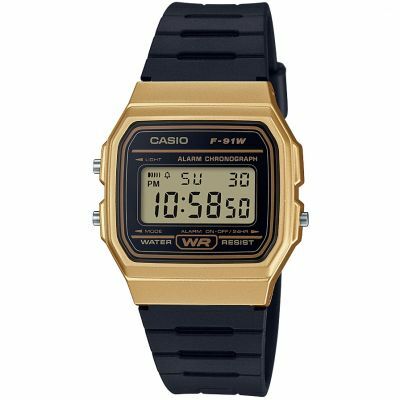 Casio Classic F-91WC-8AEF to wspaniały zegarek uniwersalny. Materiał, z którego wykonana jest koperta to plastik/kauczuk a wysokiej jakości tarcza z ekranem LCD, zaimponuje każdemu fanowi technologii. Zegarek wyposażony jest, między innymi, w chronograf (stoper) i funkcję daty oraz alarm (budzik). Jeżeli chodzi o wodoszczelność, zegarek jest wodoodporny w podstawowym stopniu - może wytrzymać lekkie zachlapania lub deszcz, jednak nie powinien być zanurzany. Zegarek jest wysyłany z 2-letnią grawancją i oryginalnym opakowaniem od producenta. A very nice retro styled watch which is great value for money. Easy to change settings and adjust. Strap is a rubbery material which is comfortable. 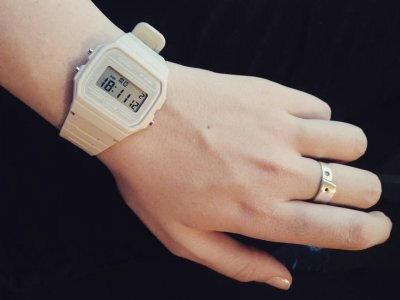 I wanted to buy a watch for my wife to wear on a daily basis, in the home and elsewhere,which was robust,comfortable,easy to read and attractive.This watch fits the bill in all respects and comes at a rock bottom price. Casio is a well known make which in my opinion has a reputation of reliability, which is another reason for my choice. Great watch, so light you dont even notice that you are wearing it. Cant beat this price too. Product was a described and arrived on time. Great watch, as most of Casio range. According to my daughter its trending now. Especially in this grey colour. Dont expect fireworks from this watch. It has some basic, most necessary modes. 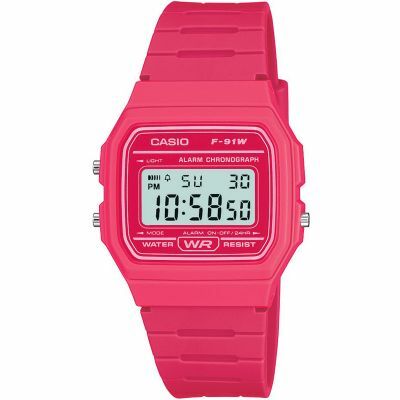 Always trendy and -as most of Casios-reliable.Great gift for any teenager especially with this price. Good travel watch. Colour goes with anything. Very flat. Good on a thin wrist like mine. I would have preferred to display to have been larger so I could easily read without reading glasses. Probably more suitable for a woman or a boy. Love my new casio watch. Big display. Goes with any outfit. Amazing watch. Amazing company to deal with! Bought every Casio watch from watch shop as the prices are reasonable compared to other retailers. The watch itself is more of a grey colour than off white. Its light and durable. Due to it being a lighter colour I presume that it would be prone to getting a bit dirty quicker than the darker colours in the range. I have two of these the other being pink and still love how easy it is to set up. On a womans wrist it isnt too big or bulky either. Display is clear and the light is a bit of a blue colour, and not as bright as the watches that are metal. I do like the strap with the notches compared to the metal ones as it is easier to adjust and doesnt add any extra cost. Awesome. A really cheap what that has the perfect function. Really impressed. I received the watch quickly. The watch is great for anyone as the strap has lots of different sizes. This means it can fit the smallest of wrists. I bought this watch as a birthday gift for my mum, and as a replacement for her old Casio which she lost somewhere in the Sussex countryside. She absolutely loves it! Its an unusual colour someone else described it as Star Wars grey in their review and I would agree with this!. I selected free delivery, but even then it arrived the very next day. Really impressed with the watch and the service! me. Love that its off white has a retro look. Good as an everyday watch that I dont have to worry about getting wet or scratching. Plus, even the buckle is plastic which is handy if you have skin that is sensitive to certain metals like me. Definitely good value for money. Great purchase - simple and effective product, definite value for money. Looks great too. I was really impressed with the quality and style of this watch, great price. 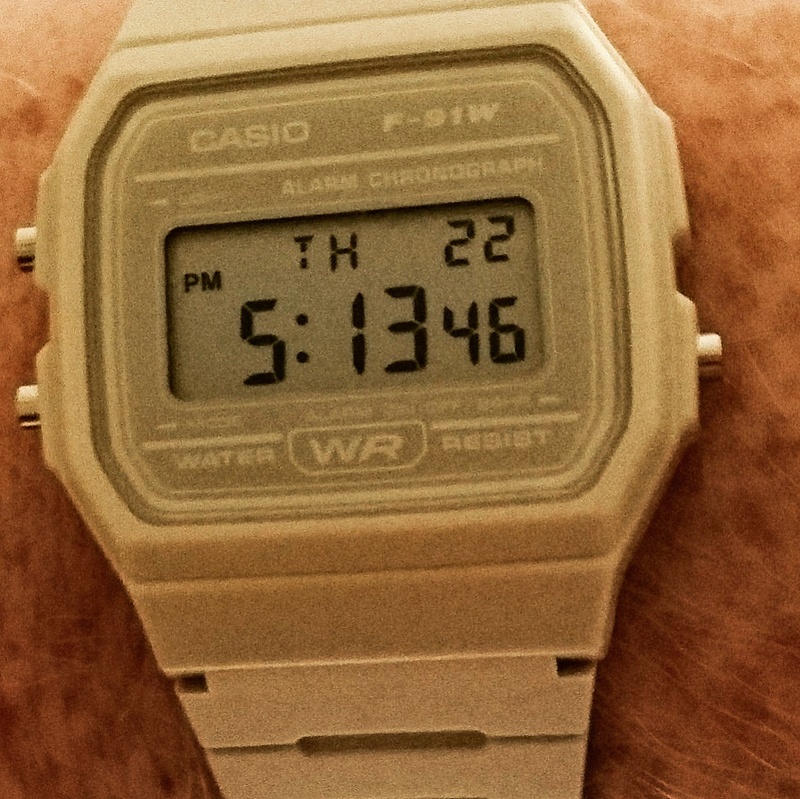 Good old fashioned Casio digital watch...........tells the time fine. Brilliant watch. Very stylish look and great colour. Stopwatch feature is very useful and would 100% recommend it to anyone for such a great price. Great watch, really cant go wrong for the price. Easy to function. Beige colour looks looks retro and cool. Exactly the kind of watch I was looking for - practical and trendy. Easy to use and set up and I primarily bought it to wear when training and its waterproof. Very pleased. I am happy with this watch, your services is very good, delivery is very quick. Great, inexpensive watch if you just need the time, date, simple alarm and stop watch. Comes in great colours too ... my son wants a blue one. Tell you what... you cant get a better watch than a cheap Casio watch. They do the job and they dont waste your hard earned dough. Plus... trendy & retro... you cant deny the perfection here. Casio watch, style was exactly what I asked for, colour slightly different as thought ordering white, but was actually pebble. But still suitable. 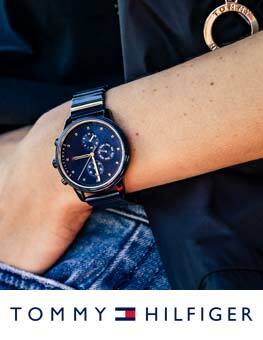 Really nice watch for my daughter, clean simple lines and really functional for a great price!! 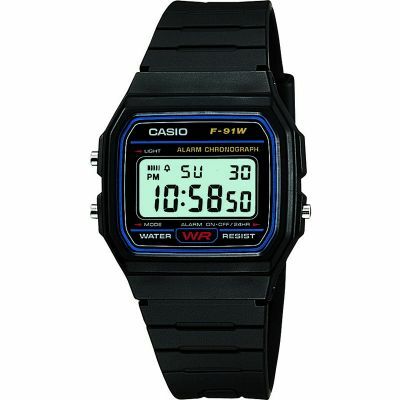 I was searching for an original grey Casio F 91 WC watch for some time, to offer this Christmas. I was a little bit concerned that I could end purchasing a replica instead an original Casio. Did a huge web an physical store research an Ive found what I was searching for it in this store with an excellent price! Besides that, I end up getting a 6% discount coupon googling for it! Purchased in the 15 and received the order on 23 December. Just in time for Christmas. The watch made a huge success and it was in a original Casio Box with all the documents that showed the authenticity. Thank you! Ill certainly will be back for more. I bought this for my niece. She wanted a watch with an alarm and stopwatch for use when she is running. It is just what she wanted, simple to use, clear display even when backlit in the dark. Although still new it looks quite durable and will probably last. Love the watch, thought it was white from the photograph and it is off white but still nice. 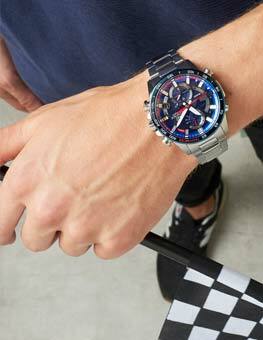 A good easy watch to wear and use. Colour is a beige colour and goes with anything I wear. Love it ! A great Casio watch and service to boot less than 24 hours to central Scotland! I bought this watch for my dad for fathers day. He spotted me wearing my baby blue one to play sports and wanted his own. This watch is great for sports, including swimming as its water resistant. I even use it for sitting exams at university because its much easier to read than my Michael Kors! Stop watch function is very useful. Highly recommended. I was looking for a simple, easy to use and stylish watch for use when walking and being outdoors. I already have a number of more expensive watches, but wanted something that would be more durable and that would survive a shower or two! 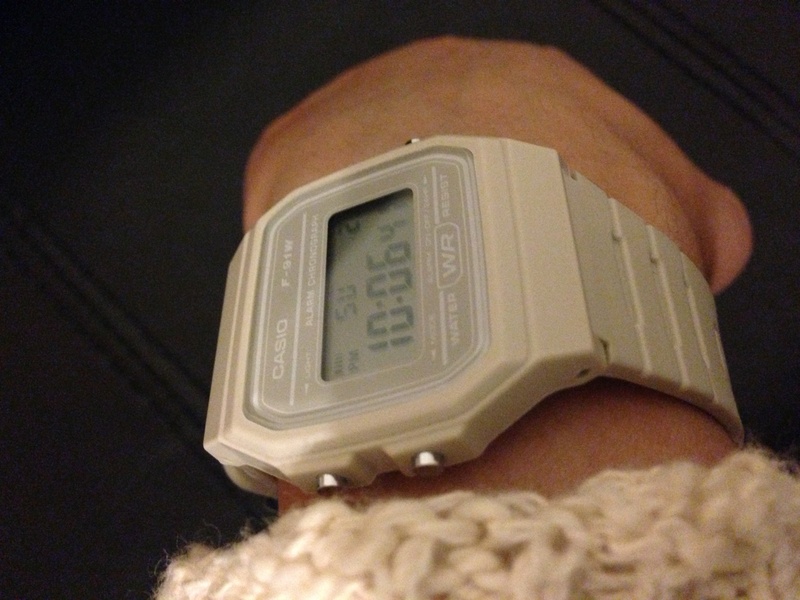 The Casio watch fit the bill perfectly, and the price was the ultimate selling point. I was trying to decide between this watch and its Timex equivalent, but the price difference was around £30 and the Timexs features did not justify the additional cost, although was more stylish overall. Very comfortable to wear and easy to clean! Fantastic watch at a fantastic price! 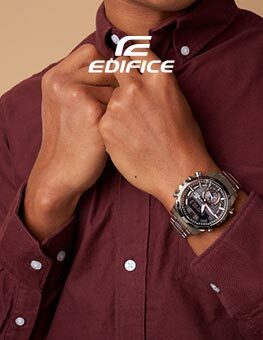 The light does not illuminate the whole of the face of the watch. Would like it if it were available in white rather than grey. Otherwise very impressed with the product. First i was looking for a good watch in the price range 250- 300€ for using doing fitness trainings and also for going out. After reading many hours about different problems mostly quality of the expensive watches i decided to get this cheap old school model. Very happy with this product. Simple retro style watch. Nice and slim. Slightly smaller than expected. Off white/ light grey colour. 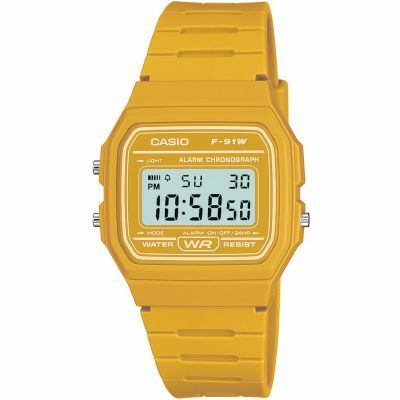 Great watch, fits well, cannot go wrong with a Casio. Bargain compared to competitors. I wanted a reasonably priced digital watch for when I cycle to work and this one ticked those boxes. It has a clear screen, large enough to read whilst cycling. It has all the functions needed from a digital watch, time, day and date display as well as an alarm and timer function. I have also received compliments about it from work colleagues for its retro appearance. It is reasonably priced and I would recommend it. Came when it said it would. All present and correct. 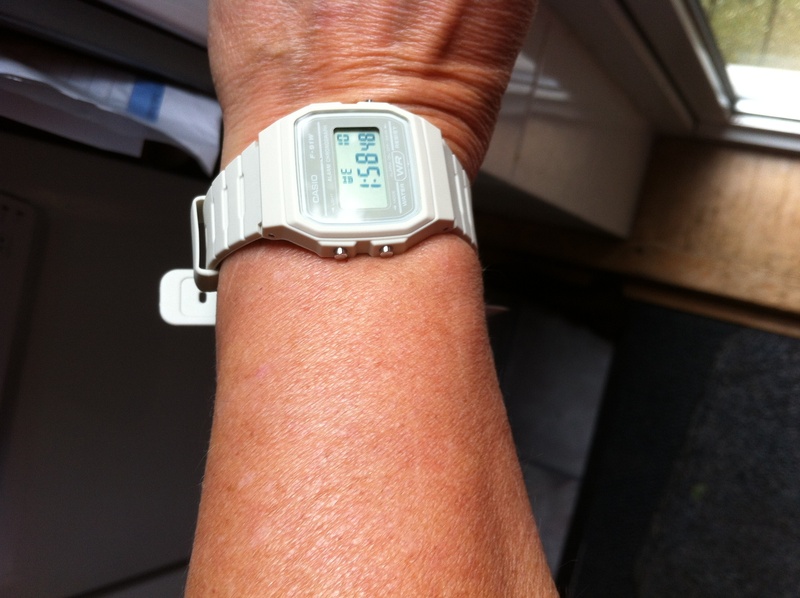 This is a white version of the watch that I had when I was twelve - it is funny, it seemed much bigger then. The watch is more of a beige colour - if you are wanting an apple white you might be disappointed. I for one like the beige - it is very much in keeping with the retro nature of this purchase - beige computers and all that. I like it. Great product. Simplistic but meets needs of a basic watch that tells the time and has a stopwatch. All I need it for in my work. Also reliable and inexpensive as I do not want one for my sports related work that cost a lot to replace. Also a great retro look ! The Watch Shop sent out my item quickly and the watch is exactly as described! Will definitely be using this company again! Good product with clear instructions, ideal for me to take on a trip to India, incorporates an alarm. Great watch, old school look! Alarm, stopwatch, and digital face. What more can you want, great price for it to. A quality product and for so little money as well. It is very easy to use and has multiple functions time, stopwatch and alarm it is simple and effective. The watch looks great and the casio style timeless. It is very comfortable and easy to wear. Item arrived a day later then expected due to Royal Mail issues, but te item is as described. This watch is a great product. Very good value and works a treat, I like all the features that are available. One improvement would be that the watch screen would light up, so you could see the time in the dark. A classic simple watch yet it has all the features you would expect. Ideal for a everyday watch at a fantastic price. I was impressed with the features of the watch, there is an alarm, stopwatch etc. the day is displayed on the main screen and the display is easy to read. There is also a button for a back light which is a very useful feature. The face of the watch is quite big so does it sit on my wrist perfectly, also the strap does not feel of a great quality. But all in all for the price I cannot complain. I love this product!!! I wanted a cheap and cheerful watch and this one goes above and beyond!! I wear this more than my other pricy watches. So retro got nothing but compliments on it! I bought this about two weeks ago now and when I opened it I was a little shocked on the colour. I cant remember what I was expecting it to be but it wasnt what I had in mind but now when I look at it I cant imagine what was wrong with it! Totally perfect and looks just like I does in the photo!! Its light and goes with just about everything you wear! Will be getting the blue one soon with my points!! Fantastic item looks even better than in the picture. Great quality and comfortable. watch is as expected, like the fit, colour, style, exactly what i wanted. 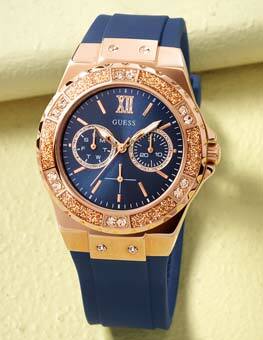 Lovely watch, feminine and retro. The alarm is more than annoying, and took forever to work out how to turn it off. Really pleased with my watch. The alarm is great and easy to hear, which was not true of a previous buy. It is easy to set. Great little watch. Great watch, simple an perfect for running, easy to use. Exactly as described.an off white colour but it makes a funky funky fashion statement too! Great little watch - exactly what I was after., a lot more sturdy than I thought it would be. Great watch fir a great price. Have a few if these watches in different colours, one of which must be ten years old now and l still havent replaced the battery. Which is amazing for the price if you think about it. I use it for swimming so l can time my laps. Great little retro styled watch. Matches the old beige CRT monitor in my office! Stopwatch comes in handy when running too!. Only problem is my wife keeps wearing it - so I might have to get another! This watch is really nice, fits perfectly around my wrist ad is really light. The display is really easy to see and the light works well in dark spaces. Its simple to work with the alarm and stop watch working great. Overall a really good buy for the money. This with is perfect for travelling! I brought one as a going away present for my friends little brother and now I brought this one for her as she goig out to see home for a month! Its absolutely perfect and really hard to break! Very nice watch came very quickly through the post, fantastic communication, well packaged. I bought this watch for myself, and find it is excellent. In fact I might buy another in a different colour. It is important that a watch also gives the date as well as the time, and the watch face is clear and readable on both counts. Fast delivery too. 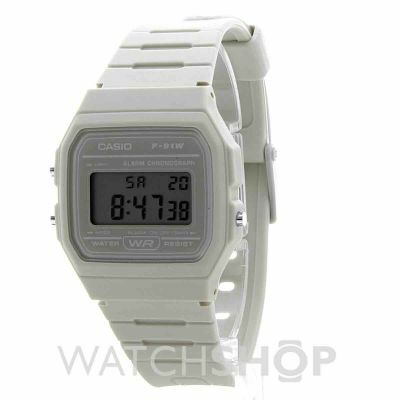 Light grey casio, great colour, still has all the features as the original Casio. Lightweight...looks great! Very Retro..
As in the picture . It dose say off white and thats the colour you get not the white as shown . But still a nice watch. And quick delivery . I honestly must be Casios biggest fan. 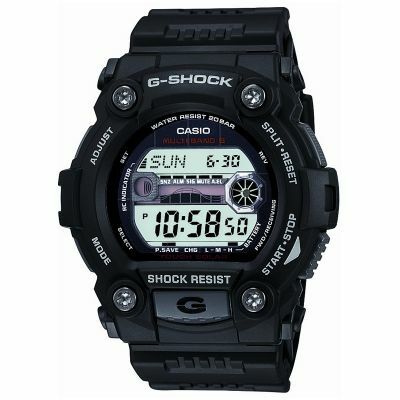 previously purchased G-shock model version but use the smaller versions such as these for work and gym, 10/10. What more could you need, Its small, light, durable, beeps on the hour ever hour 12/24 hour, stopwatch, alarm, light, water resistant and cheap- so if you wreck or lose it who cares, just buy a new one! Im just a Casio boy. What more could you need from a watch? its a small delight. They are smart and vintage. Got it in gold, silver, white, green and the black calculator version-and will continue to purchase! If you dont own a Casio your missing the action mate. Get involved. it was a great service, the product arrived within two days and in perfect shape. I would describe it as a beige colour, and more dainty that appears in the picture, which is good for girls wrists! Comes with instructions - easy to set up. I have used the stopwatch on a run and also found that useful and easy to use. Very happy with the product. It comes with instructions to program the time/date etc. which are easy to follow. The watch was set in a matter of minutes. The watch has a built in alarm clock which, isnt very loud. So it doesnt quite work to wake me up in the morning however great to use during the day. Its a great size and fits my wrist very well. Although maybe too small on a man. It fits comfortably on my wrist. I was slightly disappointed with the colour. It come across as more silvery in the images online. However it is very much the colour of an old computer. Nevertheless I quite like that, as it adds to the retro feel of the item. The colour should also be far more durable than others. The item also contains a built in light, which although not amazing it does the job when it is dark. One negative to me would be that it is only water resistant but that is more a personal issue. Overall I am very happy with the watch. Bought this as a stocking filler for my girlfriend. Excellent quality for the price and for me a retro design classic. Love the off-white colour too. Top class service. Very swift and totally reliable. Highly recommend using this site. Really cool cheap product, bought for a present, they love it. Simple, effective and reliable. For £15 you can't go wrong really! Such a fab watch and amazing easy and speedy transaction and delivery. Thanks so much! Great product. very cool . Greta service and quick delivery aswell. Exactly as I'd hoped! A retro classic! An absolute bargain that shouldn't be missed. The product is great, excatly what i wanted. Its nice and lightweight. Just a good simple watch. The only issue with the watch is that it stains way too easly. But it is a cream watch anyway. Really pleased with Casio watch. Like the retro styling of it and find very easy to use. My only concern is that the plastic strap over time may not be that durable. Great product, looks modern yet retro. It can get a little scruffy quite quickly however due to the light colour however this is easily rectified. Easy to time and comfortable and light around the wrist. 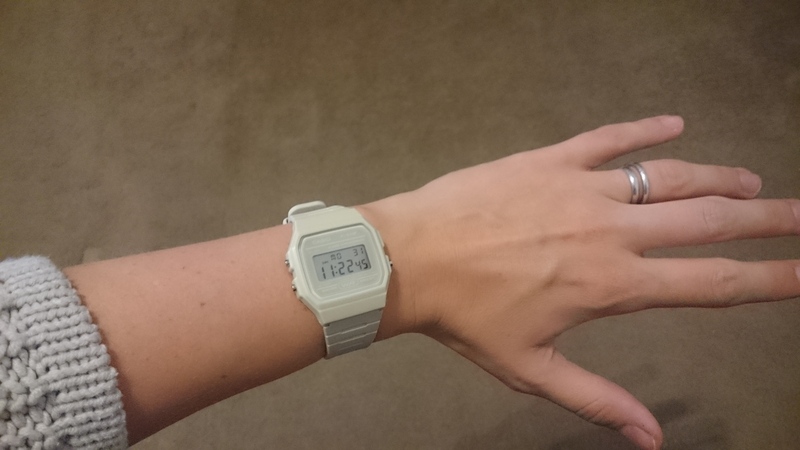 Love my funky little Casio watch - very simple to use, pretty indestructible and looks great. Excellent value for money. 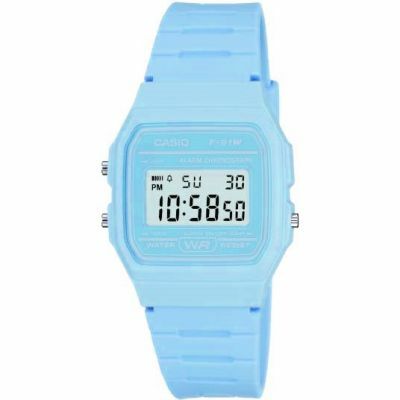 I bought this for my daughter, I love Casio, I have a small calculator that I bought 50years ago and it's still going strong. So it's definitely got to be a Casio. Great Product, Light Grey Colour, wore it to a festival the day I got it and got lots of compliments! Watch was smaller than expected so had to give it to my son. He loves it. Will shop here again as delivery was fast and prices are good. Brilliant watch, Love the retro feel. Brilliant price especially with the free delivery - and also got a fiver off it. Spot on. I purchased this watch for my girlfriend as a present. she absolutley loves it! She has wanted one for ages and thanks to the watch shop i managed to get one for her! There were a wide range of colours and styles avaliable and the watch is very lightweight and perfect to wear anywhere such as at work or at the gym. For such a small watch it has great features such as a stop watch, alram and a light aswell as allowing you to view the time in either a 12 or 24 hour setting. There is not a bad word to say about this watch and i would recommend it to a male or female! I like the basic and retro style of this watch and it is ideal for travelling which is why I chose this particular Casio. I was a little disappointed with the colour as I think it is a darker mucky brown/grey that it looked online. A good, solid and reliable watch. Excellent value for money. Simple to use and also very durable. I've had digital Casios in the past and they've all proved excellent products. It is a classical design that has been loved by all ages and through all times since it appeared in the market. I loved the idea of having a common memory and a tie with my son through this product as I had enjoyed time reading with this watch when it was given as a present. My son likes the particular function of the alarms and the 'dirty white' colour. Simple and practical. No gimmick. That is why two generations of my family love this watch. And most of all, it is affordable. The product has a great range of functions such as date/day of the week display and backlight and that's what i love about it. It is relatively big on my hand (I only have small hands though)and not particularly attractive but i was looking for functionality so happy enough. Great cheap watch does everything i need. Plus being different than the normal of black watches i go for.